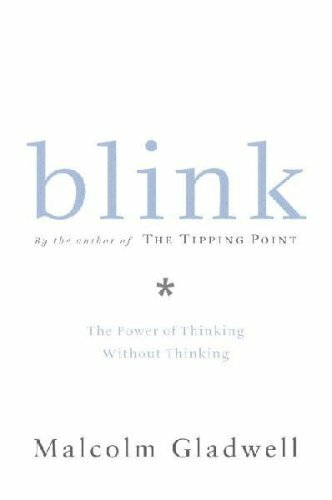 Blink is Malcolm Glaswell’s take on the art of making snap decisions that in many cases out perform a long, drawn out response. We’ve all been in situations where we thought, planned, and deliberated so long on something and it still ended up turning out wrong. Blink takes this phenomenon of “thin-slicing” and examines it from a variety of angles using interesting case studies, such as a fake statue sold to a museum after a year and a half of examination by experts only to be sniffed out by critics who instantly cringed from their gut reactions to the statue or the murder of a street youth by police officers too quick to draw the wrong conclusions. Malcolm shows us how the brain can sometimes provide us will a surprising amount of insight in a split second that rival or out perform deliberate decisions and also how they can misfire or be manipulated by all the wrong ingredients. We’re given many case studies from the world of psychology and real life where extraneous impressions are stripped down to the essence whether it’s analyzing the stability of a marriage, reading facial expressions, or correctly assessing the risk of heart attack.